AeraMax Professional - What is a HEPA air filter, anyway? 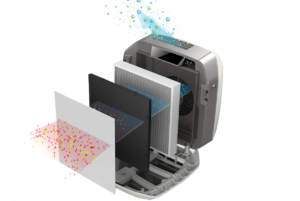 In a true HEPA filter, these methods join forces to remove 99.97 percent of contaminants, including dust, allergens, germs and volatile organic compounds. Understanding this terminology makes it easier for facility managers to select the best commercial grade air purifiers and proactively scrub IAQ problem areas.